Aim: The aim of the present study was to access the need of daily cone-beam computed tomography (CBCT) and the requirement of in-house protocols of image acquisition frequency to reduce unnecessary exposure to the patients undergoing radiotherapy treatment. Materials and Methods: The dose delivered during CBCT procedure (On-Board Imager, Trilogy, Varian medical system, Inc., Palo Alto, California) was assessed for pelvic and head and neck region. For dose estimation, cylindrical polymethyl methacrylate phantoms of 15 cm length, 16 cm, and 32 cm diameter were used to simulate the patient's head and neck and pelvic region thickness, respectively. More than 10 cm scatterer was added on either end of this phantom. Calibrated Ionization chamber DCT10 LEMO SN 1685 iba, dosimetry, Germany (10 cm active length) was used to measure the dose Index. The doses known as cone-beam dose index (CBDI100) were estimated for all the scanning protocols (kV and mAs setting) available on the machine. In this study, image acquisition frequency to correct the setup error was optimized. In-house protocol for image acquisition frequency during treatment has been suggested to reduce the dose. It was based on the principle of as low as reasonable achievable. Results: Optimized dose protocol observed was the “standard dose head” for which the CBDI100 was 2.43 mGy. Whereas for pelvic imaging, single protocol of 125 kV, 80 mA was available by which a dose of 7.61 mGy is likely to be received by the patient during scan. Maximum shift of 6 mm in lateral direction was observed to the patient of Pelvis region and 5 mm was observed in the longitudinal direction for the H and N patients. Angular shift measured in patient position was 3.8° and 3.1° for H and N and pelvic region, respectively. Conclusion: Three consecutive-day CBCT-imaging at the beginning of the treatment followed by once weekly CBCT and two-dimensional (2D) imaging in remaining days of treatment can be an optimized way of imaging for the patient having malignancy in the region of pelvic and abdomen. For H and N, once in a week, CBCT with standard dose head protocol, followed by 2D-imaging in remaining days can be an optimized way of imaging. High accuracy is a primary requirement of radiotherapy. Accurate patient positioning on couch is a big challenge of the treatment. Cone-beam computed tomography (CBCT) is a three-dimensional (3D) imaging modality which made the positioning of the patient more accurate. This technique has been integrated with the conventional linear accelerators for cancer-patient position verification during radiotherapy. It is a key feature of the On-Board Imager (OBI) of the machine, which makes image-guided radiotherapy possible. The primary purpose of the CBCT is to provide a volumetric image suitable for accurate patient positioning. Kilovoltage imaging is more suitable as MV images are poor in the form of image quality (contrast and resolution) and its 2D-imaging limitation. Compared to the relatively narrow fan beam geometry of a conventional CT scanner, the CBCT collimates a wide cone beam. In CBCT, a complete 3D view of the patient can be scan. Target localization as well as setup correction before radiation dose delivery is possible by onboard imager system of this machine. Acquisition of daily CBCT has enabled improved visualization, and localization of tumors hence enhances the quality of treatment at the cost of added patient dose. The extra dose can be a further cause of secondary malignancy as any minimum possible radiation dose can induce carcinoma. Many authors, estimated the imaging doses from various imaging systems such as OBI of Varian medical systems and X-ray volume imaging (XVI) of Elekta medical systems. Alaei and Spezi et.al. estimated the mean concomitant imaging dose of 1–2 Gy to the head and neck region during daily imaging for 40 fraction of radiotherapy. The imaging dose can be minimized by many ways such as minimizing kV and mAs setting, using extra absorbing filters, and optimizing the routine frequency of image acquisition required for patient setup position verification. The purpose of this work was to quantify the doses likely to be received by the patient during pretreatment CBCT image acquisition at a different region of the patient and the possible ways of its optimization. All measurements were performed on a CBCT 2.0 software (Varian Medical Systems, On board imager, trilogy linear accelerator, Varian medical System, Palo Alto, USA). The system uses a CsI flat panel device with an active area of 30 cm × 40 cm. In the institution, a standard focus to detector distance of 150 cm is employed for all imaging. A single focused grid is mounted directly above the detector system. The system acquires images over a 364° (182–178 degree CCW/178–182 CW) gantry rotation. The factory standard settings (Varian Medical Systems) are 100 kVp with 10 mA, 20 mA, and 80 mA for head and neck regions and 125 kV and 80 mA for pelvis region. For full fan and half fan CBCT acquisition, aluminum (Al) bow tie filters are employed that brings the half value layer at the thinnest part of the filter up to 5.5 mm Al. One full rotation takes 60 s, and the typical frequency of projections is up to 12 projections per se cond, resulting in nearly two projections per degree. Default Shepp–Logan convolution with modified Blackman window filter for CBCT reconstruction was used in this study. Cone-beam dosimetry is based on cone-beam dose index (CBDI), and preconditions are to assume a beam width that is much smaller than the length of the commonly used CBDI phantoms (cylindrical 150 mm long polymethyl methacrylate (PMMA) CT dose head and body phantoms) and much smaller than the length of the standard cylindrical ionization chamber. Doses were measured at the center and periphery (1.2 cm from the edge) of a 32 cm diameter cylindrical pelvic phantom and 16 cm diameter cylindrical head and neck phantom. It should be noted that the limited thickness of CBDI phantoms can significantly underestimate the contribution of scatter. To measure the CBDI, more than 10 cm PMMA and RW3 sheets were added on either end of the PMMA phantoms to make the phantom length more than 35 cm, so that the dose measurements can be done by considering maximum scattered contribution and to simulate the pelvic and H and N region of the patient. [Figure 1] shows setup of CBDI100 measurements in both regions. Pencil Ionization chamber DCT10 LEMO SN 1685 iba, dosimetry, Germany of active length 10 cm was used for the dose measurements in conjunction with a DOSIMAX plus A Electrometer, iba dosimetry, Germany [Figure 2]. Different formulae were given by many authors., The one of them, used in this study is the Weighted, which provides a pragmatic solution for expressing five CTDI values at well-defined positions in a CT dose phantom. CBCT is not a sequential, slice-based technique; CTDI is impractical for measuring dose in CBCT. Instead of it, continued use of the standard 10 cm chamber for CBCT dose measurement was suggested. It will provide a reasonable measure of the dose in the central 10 cm region of the FOV. To distinguish this dose from CTDI, it was referred as CBDI. Where, Dc is the dose at the center of the Phantom, and DP,avg is the average dose at peripheries. It gives average absorbed dose per unit length of the cylindrical ion chamber. This quantity can be measured with the widely available 100 mm cylindrical ionization chamber within 150 mm long CT dose phantom. 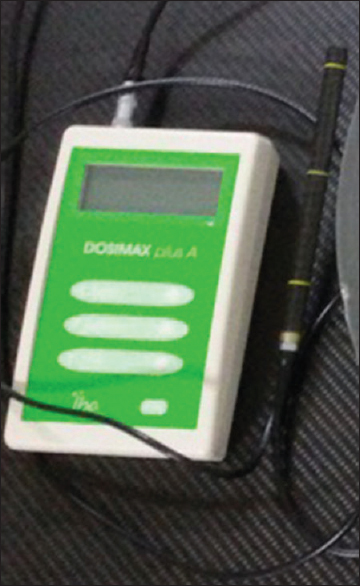 Currently, the CBDI100 is the international standard for dose assessment (IEC 60601-2-44 2002). It is defined as a 100 mm long integral of the dose profile along a line perpendicular to the axial (XY) plane divided by the product of the nominal section thickness and the number of contiguous sections produced in a single axial scan (FDA 2006, McCollough 2003, McNitt-Gray 2002). Where D (z) is the absorbed dose in air at position z, T is the nominal section thickness, and n is the number of contiguous sections acquired in a single axial scan. Same patient positioning on the couch as that was at the time of planning is necessary before the execution of the treatment. There may be two types of error in positioning. One is the systematic error and another is random error. Random setup error can be minimized by pretreatment imaging of the patient and fusion of both the images (CBCT and planning CT) gives setup variation. As the setup error is random so, daily imaging can only give accurate treatment delivery. However, on the other hand, if the treatment procedural practice (setup error) is within the limit of PTV margin (which is generally 5 mm or more), one can optimized the frequency of image acquisition to avoid unnecessary extra dose to the body as PTV margin itself can take care of this extra setup error. 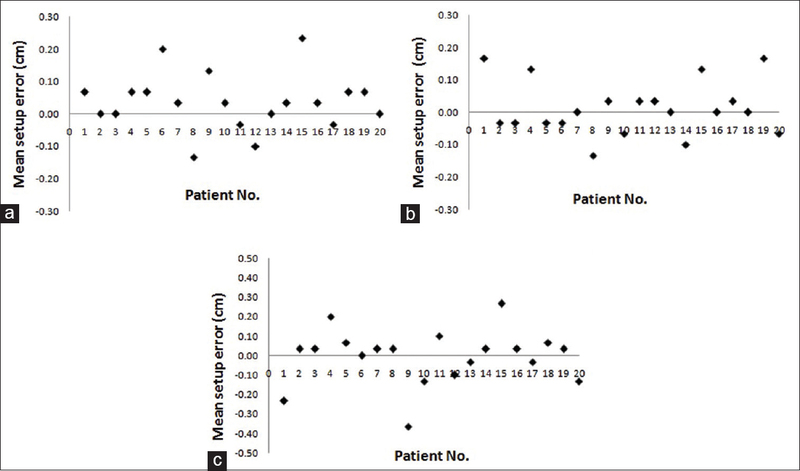 Patients of head and neck (20 in numbers) and pelvic region (20 in numbers) were selected to find out the random and systematic error in their setup. PTV Margin was calculated by formulae given by van Hark et al. CBDI100 was measured using equation 1 and 2 for different protocols of scanning. The dose indexes are tabulated [Table 1]. [Figure 3] is the pictorial representation, showing the CBCT doses in different protocols of imaging. 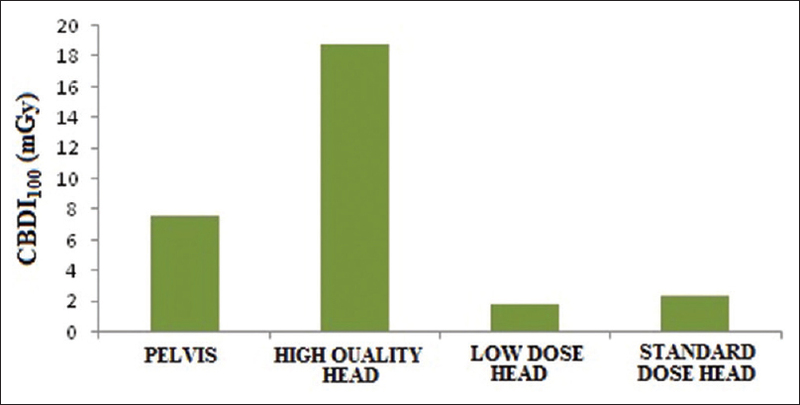 The result is showing that for head and neck region the optimized dose protocol is standard dose head (CBDI100 = 2.43 mGy). Even though the absorbed dose in low-dose head protocol is minimum (CBDI100 = 1.81 mGy) but as the image quality is poor so, it is not much useful in routine setup verification. For pelvic imaging, single protocol of 125 kV, 80 mA is available. A dose of 7.61 mGy is likely to be received by the patient during scan. Dose reduction in pelvic protocol is possible by optimizing the routine frequency of the image acquisition. Study on the probability of setup variation during pelvic region patient treatment was done. Maximum setup variation was compared with the given margin to the PTV. Moreover, the routine frequency of the image acquisition was suggested from these outcomes. The treatment setup variation was observed for the pelvis and ca-Head and Neck patients. Routine setup variation for 20 patients of each site (H and N, pelvis) was measured using bone to bone matching of CBCT-scan and planning CT of each patient. Scanning on 3 successive days was used to quantify the maximum and mean setup variation with standard deviation (SD) in all the four directions (lateral, longitudinal, vertical, and rotational). Results of the maximum and mean setup variation with SD in lateral, longitudinal, vertical, and rotational direction are given in [Table 2]. [Table 2] shows max variation in the positioning of head and neck patient is 5 mm along longitudinal direction, and this maximum shifts was observed on the 1st day of treatment and reduces during 2nd and 3rd day of the imaging. As the immobalization devices are using for H and N patients, so the probability of routine setup error will be further decreases. The value is under acceptable limit of 5 mm, but as the maximum angular shift is 3.8° which can only be quantified in CBCT images, so CBCT-imaging once in a week can be practiced followed by daily 2D-imaging during the complete course of treatment. For pelvis body part (body phantom), the average imaging dose measured for single available scanning protocol of 3 mm slice thickness, 14 mm scan length, 125 kVp, 80 mA was 7.61 mGy, but no any immoblization is using during pelvis treatment so 3 consecutive-day CBCT can be practiced during the 1st week of treatment and then once in a week, followed by 2D-imaging in another days of treatment. [Figure 4] and [Figure 5] show the mean shifts of 3 consecutive-day CBCT imaging of each patient. Standard deviation from the mean shifts of 3 consecutive-day CBCT imaging gives the random error in daily setup of each patient. Whereas the SD from the mean shifts of 20 patients will give systematic error. Required PTV Margins depends on both type of setup errors. The formula proposed by van Herk et.al. was used to measure the margins in lateral, longitudinal, and vertical directions. Where is the SD of systematic error and is the SD of the random error. [Table 3] shows the values of the margins calculated by equation 4. As the maximum margin required for both the sites of treatment is within 5.0 mm which was already taken during the countering of PTV. Hence, the daily CBCT will not be much useful. Justification of Medical Imaging is always debatable. This needs to be quantified for all the available protocols of kV-mAs. Song et al. compared the doses from OBI and XVI and quantify that OBI deliver higher imaging dose than XVI. Various authors showed many methods for dose minimization., In this study, the aim was to minimize the imaging dose by setting the image accusation frequency. Planning target volume (PTV) is one of the volumes defined in the ICRU report. PTV allows for uncertainties in planning or treatment delivery. The minimum geometrical margin of 5 mm from clinical target volume (CTV) was taken by the radiation oncologist during contouring. This margin ensures no missing of the target during radiotherapy. However, simultaneously, it compromises with 5 mm extra normal tissue all around the CTV. Hence, neither daily imaging nor the no imaging is good for the patient. One should set own departmental protocol of routine imaging based on the daily setup accuracy. If the margin of at least 5 mm from CTV has been taken during contouring of PTV, the chance of underdosing to the target structure will be reduced as in both cases (H and N and Pelvis), maximum setup error measured was 5 mm excluding one case of 6 mm lateral shift. Moreover, this error was found maximum within the 3 consecutive-day of treatment. After that, the setup error was <5 mm. Hence, 3 consecutive-day CBCT-imaging at the beginning of the treatment followed by once weekly CBCT and 2D-imaging in remaining days of treatment will be the optimized way of imaging for the patient having a malignancy in the region of pelvic and abdomen. CT scans, X-ray radiography, and mammography use ionizing radiation with which the probability of cancer induction increases. The present study is showing that 3 consecutive-day CBCT-imaging at the beginning of the treatment followed by once weekly CBCT and 2D-imaging in remaining days is the optimized way of imaging for the patient having a malignancy in the region of pelvic and abdomen. Whereas for head and neck lesion, CBCT once in a week (standard dose head protocol) followed by 2D-imaging in the days other than CBCT scan can be practiced to optimize the dose to the soft tissue. The estimated imaging dose likely to be received by the patient with pelvic protocol of CBCT is 53.27 mGy during complete course of treatment (46 Gy/23fractions). For head and neck lesion, as H and N-immobilizer makes the setup more reproducible for daily repositioning, maximum setup error of 5 mm was observed only in the 1st day of the treatment whereas for remaining days the error was <5 mm. Hence, once in a week, CBCT with standard dose head protocol, followed by 2D-imaging in remaining days can be an optimized way of imaging by which a patient will likely to receive an average dose of 14.58 mGy during complete course of treatment (54 Gy/30fractions). 2D-imaging dose was not estimated in this study as it is very small compared to CBCT dose. CBCT imaging is required if large shift of 5 mm is observed during 2D-2D matching. Once weekly CBCT imaging is necessary to correct the rotational shift of patient positioning. Maximum rotational shift was observed and corrected during the 1st day of treatment position verification CBCT imaging. Jaffray DA, Siewerdsen JH, Wong JW, Martinez AA. Flat-panel cone-beam computed tomography for image-guided radiation therapy. Int J Radiat Oncol Biol Phys 2002;53:1337-49. Sorcini B, Tilikidis A. Clinical application of image-guided radiotherapy, IGRT (on the Varian OBI platform). Cancer Radiother 2006;10:252-7. Xing L, Chang J, Orton CG. Point/Counterpoint. Kilovoltage imaging is more suitable than megavoltage imaging for guiding radiation therapy. Med Phys 2007;34:4563-6. Murphy MJ, Balter J, Balter S, BenComo JA Jr., Das IJ, Jiang SB, et al. The management of imaging dose during image-guided radiotherapy: Report of the AAPM Task Group 75. Med Phys 2007;34:4041-63. Amer A, Marchant T, Sykes J, Czajka J, Moore C. Imaging doses from the Elekta Synergy X-ray cone beam CT system. Br J Radiol 2007;80:476-82. Alaei P, Spezi E. Imaging dose from cone beam computed tomography in radiation therapy. Phys Med 2015;31:647-58. Sykes JR, Lindsay R, Iball G, Thwaites DI. Dosimetry of CBCT: methods, doses and clinical consequences. Journal of Physics, Conference Series 2013:444:012017. Geleijns J, Salvadó Artells M, de Bruin PW, Matter R, Muramatsu Y, McNitt-Gray MF, et al. Computed tomography dose assessment for a 160 mm wide, 320 detector row, cone beam CT scanner. 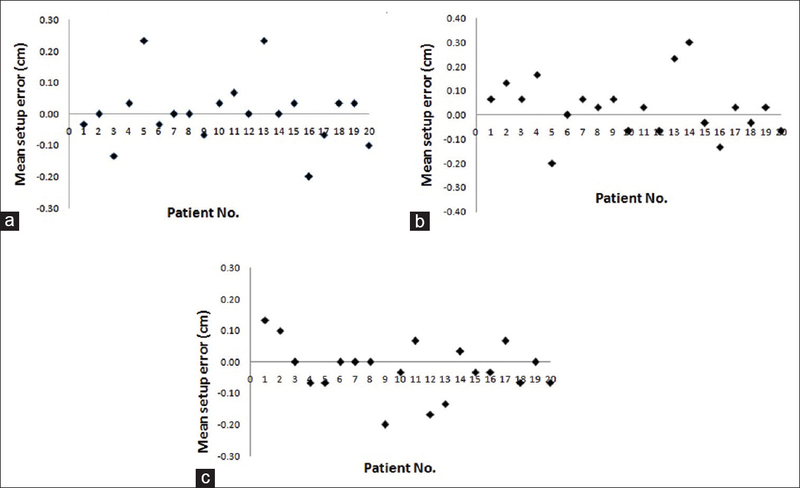 Phys Med Biol 2009;54:3141-59.
van Herk M. Errors and margins in radiotherapy. Semin Radiat Oncol 2004;14:52-64. McCollough CH. To scan or not to scan: Consideration of medical benefit in the justification of CT scanning. Health Phys 2016;110:287-90. Song WY, Kamath S, Ozawa S, Ani SA, Chvetsov A, Bhandare N, et al. A dose comparison study between XVI and OBI CBCT systems. Med Phys 2008;35:480-6. Moore CJ, Marchant TE, Amer AM. Cone beam CT with zonal filters for simultaneous dose reduction, improved target contrast and automated set-up in radiotherapy. Phys Med Biol 2006;51:2191-204. Roxby P, Kron T, Foroudi F, Haworth A, Fox C, Mullen A, et al. Simple methods to reduce patient dose in a Varian cone beam CT system for delivery verification in pelvic radiotherapy. Br J Radiol 2009;82:855-9.
International Commission on Radiation Units. Prescribing, Recording, and Reporting Photon Beam Therapy. Vol. 50. issue no 1, Bethesda, Maryland 20814 USA: International Commission on Radiation; 1993.